I’m pretty sure I saw a trailer for Alan Wake last week. Let me set the stage: I was playing Remedy’s other new game, Quantum Break, at a Microsoft event last week. The game opens with main character Jack Joyce wandering around a college campus, en route to a research laboratory. Anyway, the campus sets up a number of plot threads—a student protest, some signs giving background information on the town and characters you’ll meet later. And a TV. If you’ve played any of Remedy’s previous games—Max Payne, Alan Wake—you know the studio is fond of creating fake TV shows that play off the story in a weird give-and-take. 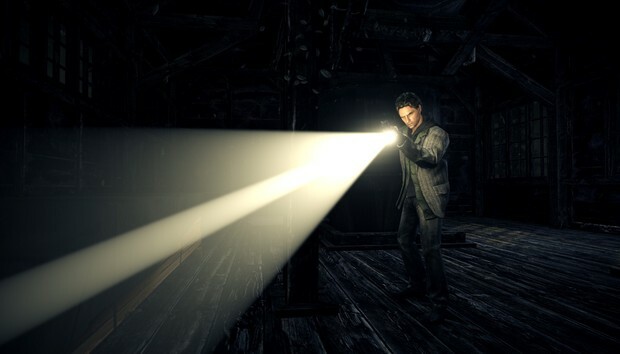 In Alan Wake, for instance, episodes of Twilight Zone-inspired show Night Springs often foreshadow events in the game. And in Quantum Break they’ve taken that to its logical extreme, building something that’s half-game-half-interactive-TV-show. This was different, though. There was just a lone TV in a tent, adjacent to the protestors. I clicked it on and...wait, is that Alan Wake? Unfortunately Microsoft specified we’re not allowed to show any captured footage from this section of the game (maybe because of this trailer? ), but there were people running around with flashlights and guns, people talking about darkness, and I’m pretty damn sure the actor who played Alan Wake/Mr. Scratch for the in-game TV show made an appearance. And the most conclusive evidence: The word “Return” (or maybe Returns?) at the end. You know—just like that Alan Wake’s Return trademark Neogaf discovered last week. As I said: I’m pretty sure I saw a trailer for something Alan Wake-related, hidden inside Quantum Break. Not 100 percent certain, but...well, enough to write this article anyway. Now, what is it? Is it a TV show? Is it a video game? Is Remedy trolling? Is Quantum Break secretly an Alan Wake game? Okay, so that last one is pretty unlikely but I have no idea. Pretty damn exciting though. We’ll keep you updated if Microsoft releases any footage or goes ahead and makes the announcement. Otherwise, keep your fingers crossed. I’d certainly take another Alan Wake.